An opposition People’s Progressive Party Civic (PPPC)-sponsored motion seeking compensation for properties burnt during Elections Night 2015 mayhem in Sophia was Friday morning defeated as government sought to justify the reaction by residents there. At exactly 12:40 Friday morning, the government benches defeated the motion for the compensation by a vote of 33- to 28. Minister of Citizenship, Winston Felix also cast blame for the burning of a house and several vehicles owned by a PPPC supporter, Narine Kublall, in Sophia and the beating of several persons there on the previous government’s management of the security sector especially on Election Day. The motion before this house must fail. While we are in sympathy with those who suffered injury and destruction of property we know that this falls squarely at the feet of those who ran the affairs of this country and I say again and for emphasis I would not support this motion and it must fail,” said Felix, a former Commissioner of Police. Minister of Natural Resources, Raphael Trotman, who went to Sophia to probe the concerns by Sophia residents and appeal for calm, denied that the APNU+AFC coalition had anything to do with the violent unrest. “There was no centrally directed thing there,” he said. He added that among the group of persons were known criminals. Before begging for peace to prevail, he recalled entering Kublall’s premises and found nothing to support the concerns by persons there. Former Home Affairs Minister, Clement Rohee said the political directorate at the time should not take blame because the operational functions of the police and army are done by the Commissioner of Police and the Chief of Staff. Minister of Public Infrastructure, David Patterson said government was committed to finding the perpetrators but in the end the police must apprehend the culprits and the courts must award compensation. “The courts shall decide who is guilty and the courts shall decide what compensation should be awarded,” said Patterson, the General Secretary of the Alliance For Change (AFC). PPPC member, Joseph Hamilton, who moved the motion, urged Guyanese to put an end to elections related violence in which people are injured, traumatized, and their properties destroyed. “They would want to be safe when they traverse the length and breadth of Guyana …We cannot speak seriously to democracy and people are hindered and harassed,” said Hamilton, a former executive member of the People’s National Congress (PNC) and the House of Israel. “We must expunge and excise from political campaign and Election Day activity in this country violence and terror,” he added. Responding, Felix highlighted that residents in the APNU+AFC coalition stronghold of Sophia had been otherwise tolerant of the presence of the PPPC Command Centre at Kublall’s residence until Hamilton declined to respond to concerns by residents about items that appeared to have been election materials. “What irritated the public were the materials he had which resembled election materials. They suspected wrongdoing. When they challenged Hamilton and they did not get the response they wanted , he walked away and went into the building and then everything went out of control,” said Felix. 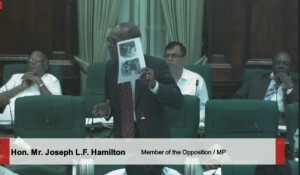 The former Police Commissioner said Inspector John Singh, whose statement about the incident was read by Hamilton in the House, illustrated his obvious political bias and the failure of the then political administration to manage the police force in a politically neutral manner. “You cannot have neutrality of the police and the question of statements being given to the opposition. I wonder how he (Hamilton) got it,” he said. 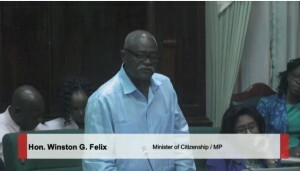 The Minister of Citizenship argued that the call for compensation by the APNU+AFC government could not be entertained because it was more about how the then PPPC-led administration had managed Guyana’s public safety “to the point where they could do very little or nothing to prevent an outbreak of violence. “It is their problem, Sir. We on this side of the house would recognise that the recklessness which took place in maintaining law and order is what resulted in all the violence and mayhem which we have become accustomed to at election time,” he said. Edghill said he was ashamed of being a legislator after listening to Felix and urged that the State, now being managed by the coalition, provides compensation in the form of monies and counseling. Questioning why only certain types of persons were being bullied, harassed and intimidated in selected areas, Edghill called for the implementation of a section of the Disciplined Forces Commission Report that recommends ethnic balancing of the security services. They are predominantly Afro-Guyanese while the PPPC’s support is drawn mainly from among Indo-Guyanese. “That is something we must consider because people must feel comfortable,” said Edghill, a former Chairman of the Ethnic Relations Commission and Head of the Guyana Council of Churches. “We should not come here to justify a culture of election violence. This must come to an end,” said the former member of the Good and Green Guyana, a now defunct PNC splinter that had been formed by Mayor Hamilton Green after he had been kicked out of that party.